CMMN case instances and plan items go through a lifecycle of states during their execution. Depending on their state, different actions may be carried out to interact with them. Moreover, state transitions may automatically trigger changes in other plan items. The concrete lifecycle of a plan item depends on its plan item definition. 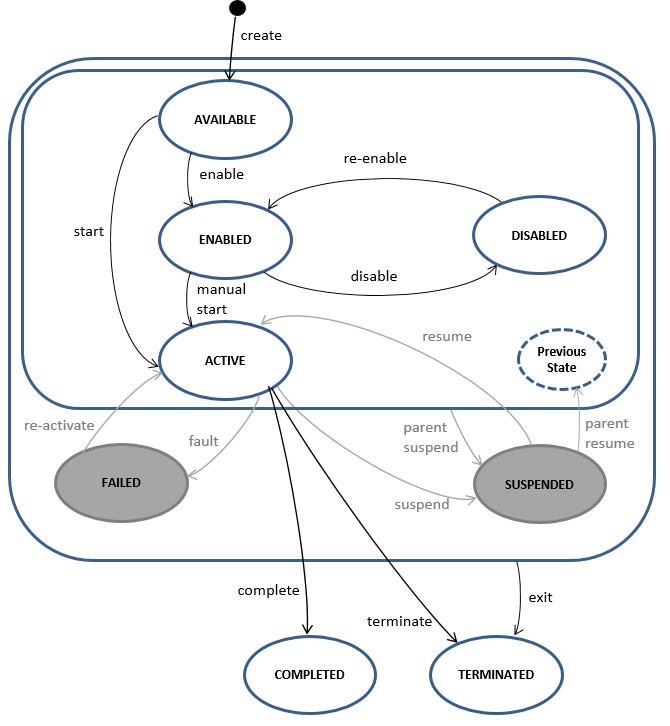 The following descriptions cover the CMMN lifecycles as supported by the Camunda engine. This is a subset of states and transitions that the CMMN standard defines. Any state or transition that is currently not supported is marked in grey. The descriptions in this section are general for the constructs they describe. Considerations that are specific for individual plan item definitions can be found in the respective sections of this guide. A user instantiates the case by caseService.createCaseInstanceByKey("case");. A new case instance is created in state ACTIVE. Two instances for each human task are automatically created, both in state AVAILABLE. The assignee completes the task instance by calling taskService.complete(taskId);. Task A reaches the state COMPLETED. 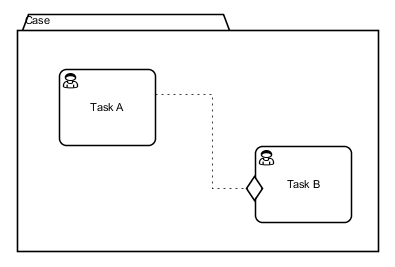 Similar to Task A, a user may now use the CaseService and TaskService to start Task B, complete the corresponding task instance, and complete Task B. Ultimately, Task B reaches the state COMPLETED. A user may close the case instance by invoking caseService.closeCaseInstance(caseInstanceId);. The case instance reaches the state CLOSED. 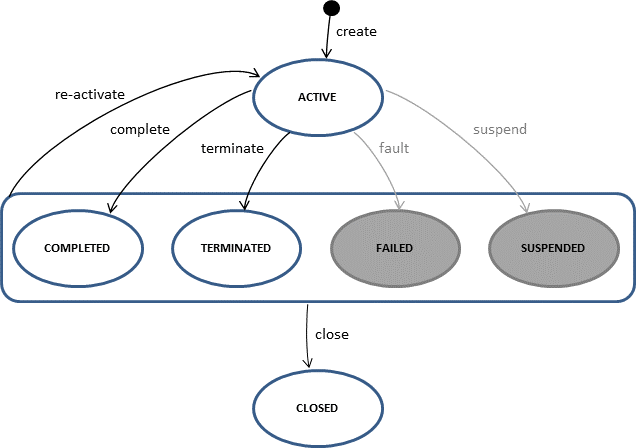 Notice how the lifecycle states define the overall state of the case and restrict the interactions that are possible. For example, the tasks A and B can only be worked on when in state ACTIVE. Before, they go through states AVAILABLE and ENABLED, which represent that conditions for working on the task are not yet met, for example that the task was not manually started or that a sentry is not fulfilled yet. Note that a CaseExecution object corresponds to a plan item, here the plan item for Task A.
active The state active is the initial state when a case is instantiated via the CaseService API. Subsequently, all plan items defined in the case plan model are created and enter the state available. completed The transition complete automatically triggers when all plan items contained in the case plan model are completed, terminated, or disabled. With automatic completion enabled, only required plan items have to reach theses states. Furthermore, it is possible to manually complete a case instance via the CaseService API if it has no active tasks or stages and all required plan items are either completed, terminated, or disabled. terminated The transition terminate automatically triggers when the case instance's exit criteria are fulfilled. Furthermore, it is possible to manually terminate an active case instance via the CaseService API. closed A case instance can be manually closed at any time via the CaseService API. This removes the case instance from the runtime database. available A task/stage becomes available as soon as the stage it is contained in becomes active. enabled A task or stage becomes enabled as soon as any of its entry criteria is fulfilled. If this is given when a the task/stage becomes available, it immediately becomes enabled or, depending on its manual activation rule, active. disabled A task or stage can be disabled by using the CaseService API. While an enabled task prevents the containing stage from completion, disabling contained tasks is one way of making a stage completable. Similarly, a disabled task/stage can be re-enabled using the CaseService API. active When a task or stage becomes active, its actual work is performed. For a stage, all contained plan items are instantiated. For a task, its actual work is issued, e.g., for a human task, a task instance is created and needs to be worked on by a user. In order for a task or stage to become active, at least one entry criterion has to be fulfilled. Activation can either be performed manually by a human worker using the CaseService API if the manualActivation rule is specified or automatically if not manualActivation rule is specified. completed The complete transition triggers for a task when its actual work is done. 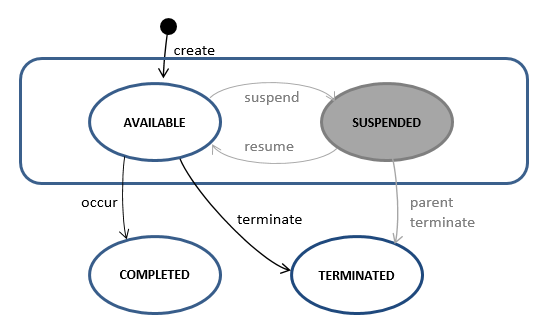 For a stage, this transition triggers when all contained tasks/stages are either completed, terminated, or disabled. With automatic completion enabled, only required plan items have to reach theses states. A task/stage in state completed is removed from the runtime database. terminated The exit transition triggers when the task's/stage's exit criteria are met or when the parent (Case instance or a stage) is terminated. Furthermore, it is possible to manually terminate an active stage/task via the CaseService API. A task/stage in state terminated is removed from the runtime database. available A milestone becomes available as soon as the stage it is contained in becomes active. completed The transition occur automatically triggers when all entry criteria of the milestone are fulfilled. terminated It is possible to manually terminate an available milestone via the CaseService API. A task/stage in state terminated is removed from the runtime database.